If there’s been one film that has seemingly captured the zeitgeist of the internet this summer, that honor would have to go to Mad Max: Fury Road (another blow to the dire fate of Entourage). Audiences are enthralled with the simple yet archetypal storytelling and the incredible practical stunts and effects. Meanwhile, artists from around the world have found much to re-enact, re-purpose, and remix from the film. It’s the movie that keeps on inspiring new memes, videos, and other internet ephemera on an almost daily basis with each one being a slightly different take on an otherwise straightforward work. Enter into this fray the latest interpretation, this time by artist Pablo Fernández Eyre. 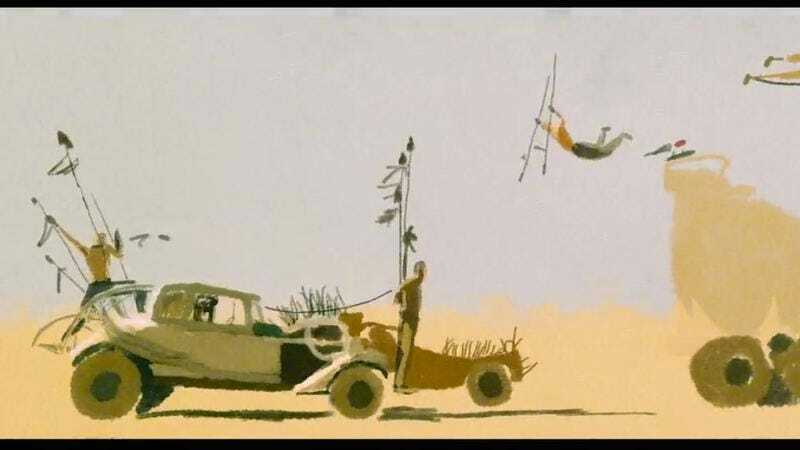 Eyre has taken the trailer for Mad Max: Fury Road and, using Photoshop’s “Grut Oil Dense Weather” brush, turned it into a watercolor animation. It’s a rotoscoped look that makes the blockbuster appear to be some impressionistic piece that actually adds to the kinetic energy of George Miller’s already frantic film. Animated “Mad Max: Fury Road” Tribute from whoispablo on Vimeo.